Over the 10 years since its launch, Amazon Prime has grown from an offering tied to shipping to become a wide-reaching, significant force in Amazon.com’s business. For much of 2014, Amazon.com’s stock had been in doldrums, shedding a quarter of its value as investors fretted about either skimpy profits or too-frequent losses. On Thursday, Amazon reported a $214 million profit in the fourth quarter, slim given the company’s $29.3 billion in sales. But the black ink was well ahead of analyst expectations. Amazon stock soared on the news, regaining $20 billion Friday and nearly $5 billion more Monday, closing at $364.47, up $9.94. 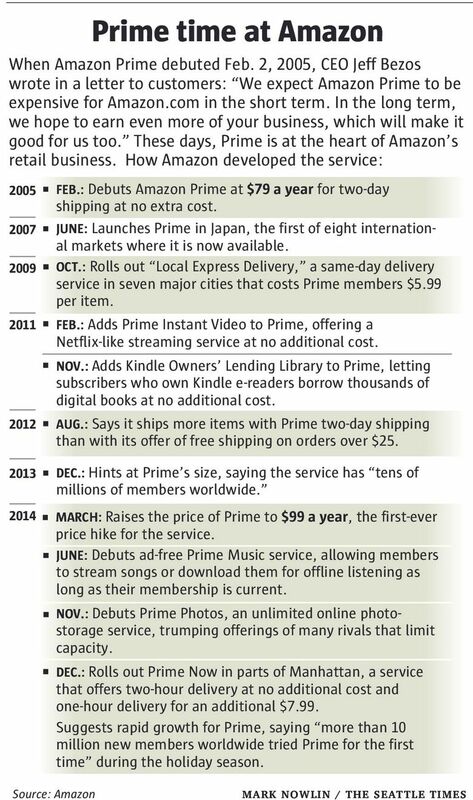 There were few outside Amazon who believed that Prime could be the engine it has become when it debuted 10 years ago. On Feb. 2, 2005, Amazon rolled out the service with a note from Bezos, greeting shoppers on the home page of the company’s website. It took some time, as Bezos suggested, but Prime has proved those doubters wrong. The service has moved from a shipping program to the heart of Amazon’s retail strategy. “It’s absolutely core to our retail business,” Greeley said. Bezos seized on the idea and pulled together a group of executives in November 2004 in the boathouse at his Medina home. He told them to come up with a proposal by Amazon’s next earnings call, at the end of January. But when Amazon launched Prime, “tens of thousands” of customers signed up in the first month, agreeing to pay the $79 yearly fee, Greeley said. Amazon won’t disclose the number of Prime subscribers, though the company has given various hints. When it announced financial results last week, Bezos said in a statement that Prime grew 53 percent worldwide. A year earlier, the company said it had “tens of millions” of Prime subscribers. Those data points, and other research, have led analysts to peg the number at 40 million members or more worldwide. So conservatively, Amazon is generating $4 billion from Prime members on just the $99-a-year member fees alone. But that’s hardly what makes Prime such a lucrative business. Prime changes customer behavior. When shoppers shell out $99 to be Prime members, they often spend the rest of the year trying to justify that purchase. If they see a pair of shoes they like for roughly the same price on Amazon.com and another site, they’ll often buy from Amazon to validate that membership. 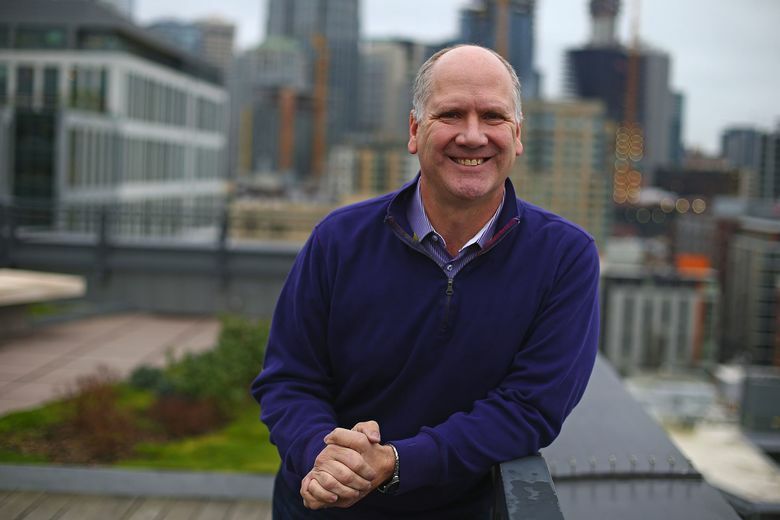 “When a customer becomes a Prime member, they do step up their purchases considerably,” Amazon Chief Financial Officer Tom Szkutak said in a conference call with journalists after the company reported results last week. Amazon won’t disclose how much more they shop, but Consumer Intelligence Research Partners, which tracks Prime data, believes members spend 2.5 times as much as non-Prime customers. What’s more, the firm believes those members account for about two-thirds of Amazon retail revenue in the United States. In February 2011, Amazon bundled in its Netflix-like video-streaming service, Prime Instant Video. Nine months later, it added the Kindle Owners’ Lending Library to Prime, letting Prime subscribers who own Kindle e-readers borrow thousands of digital books at no additional cost. At the time, Greeley said, Prime had “millions” of members. The new benefits triggered a rapid uptick. A survey of 1,774 members last September by the investment firm RBC Capital Markets found that 10.1 percent of Prime members said unlimited video streaming was the “most important” reason they signed up for Prime. “Perhaps Amazon knows what it’s doing with this Prime unlimited streaming video thing,” RBC analyst Mark Mahaney wrote in the report. RBC’s Mahaney believes the growth of Prime might help resolve one of the most long-standing Amazon investor gripes — skimpy profit margins. He thinks Prime could have between 55 million and 85 million members by 2016. That could mean as much as $8.5 billion in revenue, just from membership fees. While Amazon is likely to pump much of those dollars back into its business, it’s also getting new revenue from last March’s price increase. Amazon isn’t about to become a profit machine. But as Prime approaches its teens, it may well help Amazon deliver margins that have long been elusive.